I must confess that I am hardly a fan of Robert Crumb, the legendary comic artist until I watched the documentary film titled “Crumb”. Later, I got his book “The book of Genesis” and became a big fan of his art. I did came across his works in the past and, but was never inclined to read or get any of his comics then. I always felt his cross hatching was too heavy and dark for my taste, more than anything else. But after reading “The book of Genesis” which he illustrated- it somewhat changed my view on it. His meticulous and attention to details in this book really make him one of the great comic artist of this era. 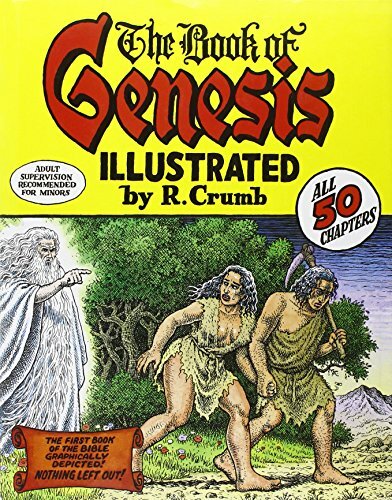 “The book of Genesis” is considered Crumb’s magnum opus and took over 4 years to complete. In the foreword to the book- he claimed it to be his most faithful visual interpretation of the Book. Crumb’s heavy cross hatching style works really well in this comic book and he illustrated each panel with so much care and details. This is really an amazing book , if not just to see the artworks! Highly recommended!